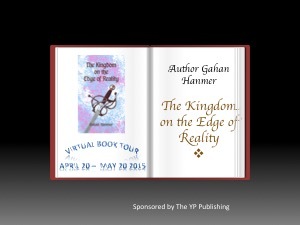 Gahan Hanmer is the author of “The Kingdom on the Edge of Reality.” Gahan shares with his readers the story behind his writing. Gahan Hanmer was born into a family of actors and painters. As a youth, he received satisfaction and appreciation from the work he did on the stage, which began when he was eight years old. Under the guidance of his uncle actor Marlon Brando, Gahan developed his talent exclusively as a theater artist, working with many inspired teachers and directors. Gahan found himself working on and off in the classical theater and supported himself with various odd jobs.Trained in the Stanislavski ‘method’, living truly in the skins and minds of these characters, he absorbed what each of them had to teach him. Later in life, after he had stopped working for the theater, he began to try to organize some of what life had taught him in a novel of romance and adventure. Every night, after his two daughters were in bed, he became the main character in a perilous mythical journey and recorded it as it unfolded in his imagination. Years later, rewritten and revised many times and finally pruned and polished, the result was The Kingdom on the Edge of Reality.